Arista's line of high-quality developing trays are made of durable, easy-to-clean, lightweight plastic. The fluid guides prevent the print from laying flat on the bottom aiding in thorough development and offering enough space for your tong blade to get under. 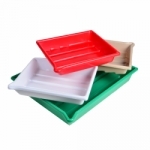 The pour spout makes emptying your tray easier with less mess. Includes tong-rest notches that help keep your tongs from sliding into the chemistry! We recommend a different color tray for each chemical type.